The Scholarship is offered in an effort to assist a young Sandwich resident with college expenses as they pursue their educational goals. If you would like to sponsor the SRTC 2018 Scholarship, please send a check made payable to “SRTC Scholarship” to P.O. Box 1998, Sandwich, MA 02563. The Sandwich Republican Town Committee (SRTC) is pleased to announce that the recipient of its 2015 scholarship is Ms. Emily Walker, daughter of Clinton and Carolyn Walker of East Sandwich. Applicants were required to submit grade transcripts, work and community involvement, proof of voter registration and an essay in order to be considered for the $1,000.00 scholarship. The SRTC received applications from several outstanding and well-deserving students extensively involved in community and volunteer activities, sports, school activities and charitable efforts. While not an easy decision to choose just one recipient, it was Emily’s clear and concise concepts that made her stand out. Her excellent grades, volunteer work, principles and career objectives are admirable and exactly what we hope for the future of all young adults. A graduate of Sandwich High School and community volunteer, Emily will be attending Boston University this fall where she hopes to further her education and interests in International Business. 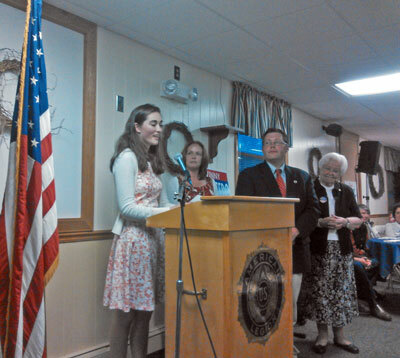 The Sandwich Republican Town Committee (SRTC) awarded its 2014 scholarship to Ms. Daphne Vantine, daughter of Nicholas and Linda Vantine of East Sandwich. The SRTC received applications from bright and well-rounded students involved in church, community activities, sports and charitable efforts. And while all candidates were seriously considered, our committee experienced a first this year. For the first time, in the history of awarding the scholarship, our committee unanimously voted in the first round to award this year’s scholarship to a special young lady, Miss Daphne Vantine. A graduate of Cape Cod Academy, Daphne is a Cape and Islands Basketball All-Star and varsity basketball and soccer player who has been very involved in sports medicine and health related organizations. Daphne’s volunteer work has included the Cape Cod Hospital, the Red Cross and Cape Cod Cares For The Troops. Daphne will be attending the University of Delware this fall where she hopes to further her education and interests in physical therapy and rehabilitation technology that will improve the lives of athletes and veterans of the U.S. military. On June 12, 2012, before a large and enthusiastic crowd of supporters and activists at a fundraising event held for State Representative Randy Hunt (R-Sandwich) at Tomatoes Restaurant, the Sandwich Republican Town Committee (SRTC) awarded a $1,000.00 scholarship to Mr. Ian Kirkwood, son of David and Lisa Kirkwood of Sandwich. Applicants were asked to submit grade transcripts, work and community involvement, and an essay. Never missing an opportunity to encourage young people to vote, the SRTC included an additional requirement that applicants needed to be registered to vote. Among the applications received by the Committee were community volunteers, varsity athletes, students with perfect grades and students with part-time jobs. It is never easy to choose just one, but this year it was the outstanding essay written about the Constitution and the powers provided in the clause of what is “necessary and proper” that topped the list. A top-notch student, volunteer tutor, mission trip volunteer, sailing instructor and a hard-working supervisor and employee are just some of Ian Kirkwood’s attributes. Ian is a 2012 graduate of Sacred Heart High School in Kingston and will be attending the College of William & Mary this fall. June 2011 - Before an excited crowd of over 150 activists and guests, the Sandwich Republican Town Committee (SRTC) held a Flag Day Celebration at the Sandwich Glass Museum on June 14, 2011 with Special Guest WRKO radio host and author Michele McPhee. 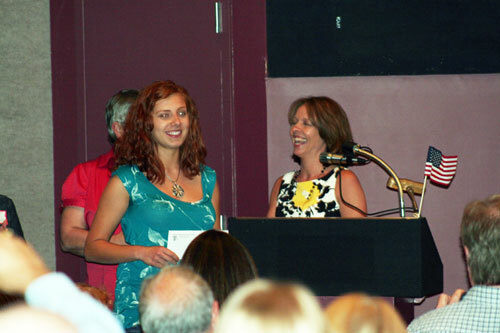 At the event, the SRTC awarded a $1,000.00 scholarship to Carly Tefft of Sandwich. The applications received by the Committee were inspiring. Among them were athletes, musicians, community volunteers, and students with perfect grades, students with part-time jobs, volunteers from various campaigns and some already on paths to military careers. Many were deserving, but there was one whose outstanding essay written about giving up personal freedoms for a more secure Country put her at the top of the list. Carly Tefft was selected by the SRTC as this year’s recipient. She is a member of the Glass Chapter of the National Honor Society, has been a tutor in 2 subjects for the last 2 years, volunteers for the Sandwich 5K Turkey Trot, volunteers for the American Cancer Society’s Relay for Life, volunteers for the Homeless and has worked every summer for the last 5 years. In addition, Ms. Tefft is a singer/songwriter and performer, playing the piano, drums, guitar and ukulele. Ms. Tefft is a 2011 graduate of Sandwich High School and will be attending the Berklee College of Music this fall. The Sandwich Republican Town Committee encourages residents to visit their website at www.sandwichrepublicans.org where event and Committee information is available. The website also contains information about meetings and how to sign up to help Republican candidates both locally and nationally. The SRTC also maintains a page on Facebook.